Sorry it has taken me so long to post my highlights of Natural Products Expo West. There’s so much to report, I still haven’t gotten it all in there. Although I only went for one day, I saw so much and it was honestly overwhelming! 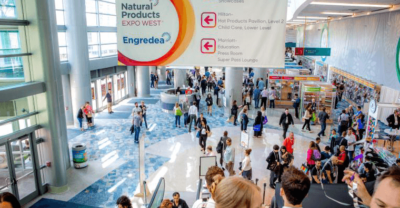 Expo West is a huge, and I mean HUGE, natural products trade show in Anaheim with something along the lines of 3100 distributors, about 1/6 of them are first-timers. It’s mostly food, but there are tons of beauty care companies, supplements, pet food, food scientists and packaging companies. It runs for 3 1/2 days and I don’t know that I could really handle more than one day. Although it’s very crowded, it’s a great opportunity to meet with companies and see what’s new for them and really have the chance to ask them questions about their products. The Paleo movement is strong and not losing steam. People are still into the Paleo diet which, in a nut shell, avoids processed food and sugars, dairy, refined oils, all grains and legumes, but favors fruits and vegetables, roots, nuts and seeds, coconut and avocados, and animals raised in their natural environments, such as wild fish and grass-fed beef. I saw a lot of jerky, grain-free chips and tortillas, grain-free flour blends and mixes, grain-free baked goods (not that cavemen were making almond flour muffins; just saying) and lots of new cauliflower-based products like tortillas and pizza crusts. Bars. Good heavens, it seems like whenever a company wants to branch out and create a new product line, they go with a bar — granola bar, power bar, protein bar, energy bar, snack bar, collagen bar, and so on. Read your labels! All these companies claim to be “natural” and “healthy” but most of the bars I saw were basically candy bars, with the first ingredient being a sugar derivative. Probiotics in packaged foods. Hmmm, not sure how I feel about this one. I’m all for probiotics, but I’m not quite sure how the “live probiotics” stay viable in a granola bar and popcorn. Lots of probiotic-infused drinks, too. Drinking vinegars. I’ve posted about Suja Drinking Vinegars before and I love them. I saw a lot of drinks with raw apple cider vinegar added. Farmhouse Culture has a yummy one. Alternative pastas. We’ve been seeing legume-based pastas on the scene for a few years now, but I really saw a lot at the expo. Lentils of all kinds and different beans turned into pasta, and sometimes with “superfoods” added. I am into legume pastas as a change of pace and I love that they are fiber-rich and full of protein. They are often much higher in calories, though. I don’t personally count calories, but they do matter if you’re trying to maintain or lose weight. Mushrooms. Japanese mushrooms are well known for their health benefits and immune-boosting properties. There were lots of products with dried mushrooms added, from granola bars to drinks. I am a huge fan of the Four Sigmatic brand and got to sample many of their drinks. Love! Dairy-free Alternatives. Almond milk is pretty common, but now other dairy-free milks are sharing the spotlight. Oat milk and cashew milk were both in abundance, as well as lots of coconut milk products. I was also happy to see Kite Hill there who makes my favorite almond milk cream cheese, ricotta and yogurt. Stress-relief. I could have used some of these products at the end of the day! Products infused with adaptogens (I’d like to write a post on these soon) which are compounds that help the body adapt to stress (e.g. ashwaganda), and calming drinks and sprays were more prevalent than I saw last year. Maybe I’m just in need of more stress-relieving products this year! For those of you who take ghee in your coffee or for travel/camping, I love these little packets. 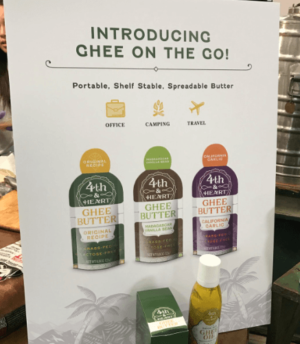 Fourth and Heart is one of my favorite new companies and their ghee products are outstanding. Their ghee is from grass-fed cows and contain flavors like vanilla, garlic and truffle (not “natural flavors”, mind you — actual garlic, etc.) Ghee is shelf stable so you do not need to refrigerate it. What I love about it, besides the rich flavor, is that it is acceptable for higher heat cooking. I am not sure if these packets are available yet, but Fourth and Heart can be found on thrivemarket.com and Whole Foods. I tried kombucha, a fermented tea with probiotics, many years ago, but I didn’t really get into it until recently. I have started to appreciate the bubbly, fresh taste and I especially favor Health Ade, which has the most delicious flavors. Further, Health Ade products are hand-crafted in small batches using only organic and raw ingredients, flavored with cold-pressed juice, fermented 100% in glass and packaged in uv-protective amber bottles. Amen. 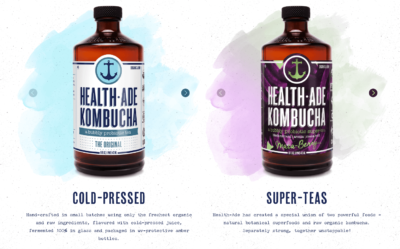 My favorite Health Ade kombucha has been Pink Lady Apple, but their new line of Super Teas is amazing, infusing superfoods like wheatgrass, spirulina, maca and reishi. Look for the Reishi-Chocolate one! I know, I know. I am a little skeptical of the whole probiotics in snack foods trend, but these popcorns are not only tasty, they are so pretty too! Living Intentions’ new line of popcorn features probiotics and such superfood ingredients as turmeric, macqui berry, chlorella and maca. 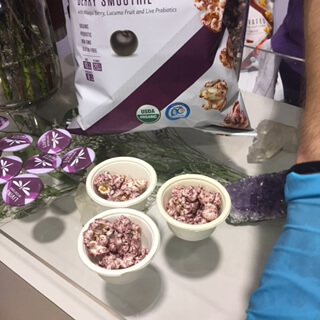 I want to have a party so I can serve the Berry Smoothie flavor (it’s the most beautiful lavender popcorn I have ever seen!) My daughter and I are huge fans of their activated superfood cereals. What in the world does “activated” mean? It’s a marketing term used by the company to mean “Food at its highest potential” which could be superfood, could be probiotic, could be sprouted, or likely a combination of a few of those things to make a high-energy, nutrient dense food. Let’s just call it a high quality snack food. I’m good with that. I have written before about Vital Proteins collagen peptides, which I take everyday with my warm lemon water in the morning. I have been taking 1 scoop religiously for 3 months and I am starting to notice that my hair is a little (not much, but a little) stronger and thicker. I believe in the benefits of bone broth and the collagen that comes with it, but I can’t drink bone broth every day. That’s why I started taking the collagen peptides. I am about to try out their Marine Collagen, which is extracted from fresh wild-caught snapper. I’ll let you know how that goes. 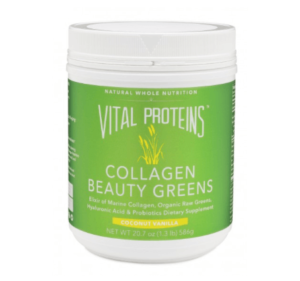 I had a sample of their Collagen Beauty Greens, which is their marine collagen peptides combined with greens, probiotics, coconut water and vanilla. I thought the taste was super mild and the product blended into water very easily without any grit. Their Beauty Water product was very intriguing to me, but is not available yet. You can bet I’ll be trying that one pronto! With any natural product, you often have to take it religiously and be prepared to wait several months to see any visible results. I love all the Food For Life Baking products as most of them are sprouted. Sprouted grains are more digestible and contain more nutrients! 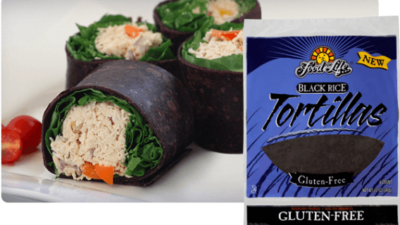 I sampled their new gluten-free black rice tortilla and it was delicious! It was soft and pliable and tasted like a basic tortilla. So why bother with black rice? Black rice is often overlooked, yet it’s a true “super grain” loaded with vitamins, minerals and natural anthocyanin (antioxidants). Black rice rivals and often exceeds some of the most notable antioxidant rich foods. Plus it’s loaded with natural fiber making it a great healthy alternative to traditional wheat flour tortillas. I have been a die-hard almond milk fan for years, but I like changing it up, too. 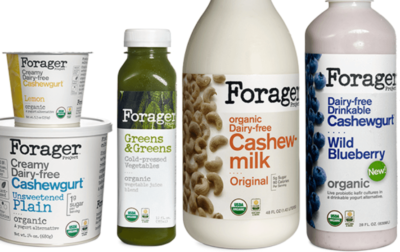 I really like the Forager Project cashew milk products. They are clean and natural, and I love the richness and creaminess that you get from cashews. The plain, unsweetened yogurt is quite nice, but all their flavors are delicious. More gut-supporting foods here! 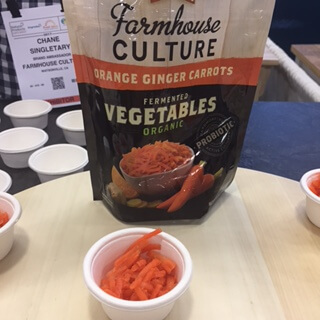 I love the Farmhouse Culture sauerkrauts and gut shots, but I was particularly smitten with their fermented vegetables which I sampled at the expo. The orange ginger carrots were delicious. I could see adding them to any number of bowls or salads just eating them straight out of the bag! As always, I received no compensation for mentioning any of the products above. I did sample items at the expo but all opinions here are my own.